In this Accomplissement II - Klimt tapestry we see the work of Gustav Klimt (1862-1918), one of the primary members of the Viennese Succession Movement of art. One of his most famous works is the Fulfilment portrayed here, with their garments surrounding them made of geometric patterns. The spiraling tree of life in the background contains flowers which even look like a geometric design. Such radical ideas of pattern juxtaposed with other elements is a hallmark of Klimt's work. The color palette is golden and accentuated by yellows, reds and black and whites. 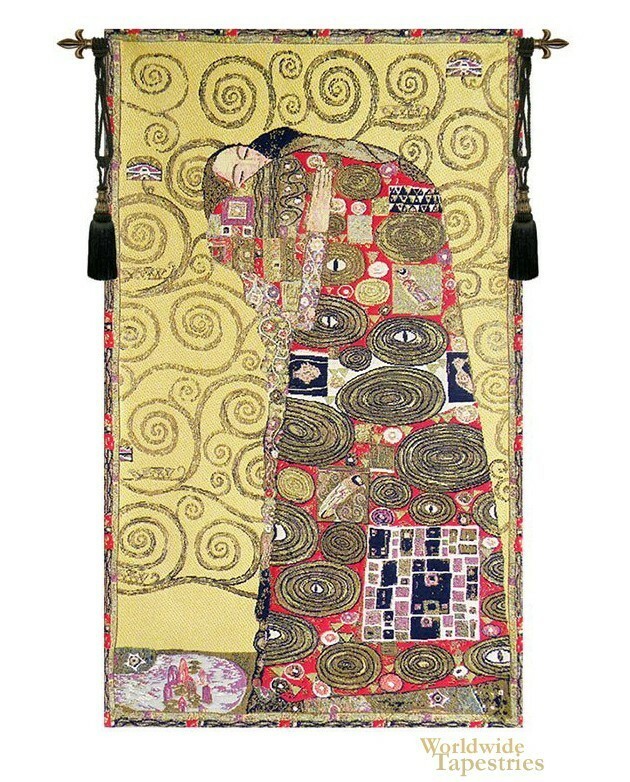 This Accomplissement II - Klimt contemporary and modern art tapestry is backed with lining and tunnel for easy hanging. Note: tapestry rod and tassels, where pictured, are purchased separately. Dimensions: W 18" x H 29"
Dimensions: W 27" x H 45"
Dimensions: W 37" x H 58"